Beautifully written. Deeply Honest. Thoroughly Heartfelt. about mustering the courage to hold onto to the kind of love that comes once in a lifetime, no matter what hardships arise. I’m not sure whether I should start by praising the beauty of the writing or the story, or perhaps I can make my thoughts entwine as I convey the ingenious simplicity of this book… soft, yet striking, honest and heartfelt, filling and warming as its deceptively quiet power seeped through me slowly, moment by moment, raw and real. This isn’t the kind of story with peaks that stun you or valleys that shatter you… it isn’t the sort to shake you into a violent fit of sobs either… it’s a subtle release of emotion… it’s the tears that fall so slowly you hardly register them as they slide down your cheek. Our characters are very relatable and real. The feelings that develop between them waver, grow and intensify over time, learning to love the other in the unique and perfect way that only they can. This is the story of two people, that despite the hardships they’ve endured have retained that intrinsic goodness within. Two people which fate brought together only to challenge them with the most despairing of circumstances. Two people who fell in love so completely that they summoned unfathomable courage to fight against all the odds for their happily ever after. Danny and Leah weren’t supposed to meet, but fate smiled upon them one day when Leah nostalgically drove by her old home, a home which simultaneously filled her with sadness and happiness. Memories of her mother danced before her as she replayed all those wonderful times they spent there as a family before she was tragically lost. When an angered driver forces her to pull into the driveway at the exact time the current homeowner sees her, whom then surreptitiously invites her in for tea, and shortly thereafter brings her face-to-face with a ruggedly beautiful dark-haired boy with light eyes… well, her life irrevocably takes a different turn that day. But unbeknownst to her, all she knows is that she can’t stop thinking of that boy after she leaves. Leah has been hurt by love in the past. Her too-trusting nature has blinded her before and unfortunately given her a harsh lesson at a time that was already difficult. Since then, she’s retreated into herself, following the motions of her life as she basked in the happiness of her friends and family… but not her own. Danny, on the other hand, has also seen his share of disappointment. He struggles with lessons learned too late and is burdened with the kind of guilt that consumes. They’re both a bit broken at the time they meet. When fate intervenes once more, they begin to develop a friendship, as threads of an intangible something gradually weave together, first taking the shape of companionship charged with an unspoken attraction. But as effortless as some of their moments seem to be, Danny begins to brusquely push away. His behavior vacillates between an honest softness and tenderness, to a mysterious and closed-off detachment. Yet the more time they spend together, the more Leah is drawn to Danny despite his erratic behavior. Through alternating POVs we realize Danny has a secret. The kind of secret that promises to change the course of his life… his future. He can’t allow to get too close to this “sweet girl.” The girl that with her openness and kindness makes her way into his heart. You can’t help but love Danny. It’s so very clear that he’s the best of people. Loyal, hard-working, caring. He owns up to his responsibilities and doesn’t want to hurt others. His resolve falters, however, because his burden somehow lightens as his heart begins to fill each time he’s with Leah. I love the way their relationship blossoms. It felt very real because we had the opportunity to get to know them as individuals, slowly understanding them and connecting with them and ultimately caring so much for them that their emotions mimicked my own. They got to know each other unhurriedly, with heartbreaking setbacks and many moments of joy. But yet, time threatened and Danny questioned everything, while at the same time knowing that Leah had changed him in a very permanent way. They each had moments in which they knew that this was something worth fighting for. A moment in which they knew a future apart was no longer a possibility. That notion gave me a feeling of fullness and hope which settled deep within. To Danny, Leah gave him hope and courage to withstand his dire circumstances. To Leah, Danny re-awakened something long-forgotten that gave her the strength she needed to fight for their love. Without giving away one of the central elements on which the plot revolves, I can simply say that the story made me feel all kinds of emotions that had me connecting with the story in a very real way. It felt intimate and honest and pure. All I can say is that I could’ve read more, wanted more epilogue because I wanted more them. 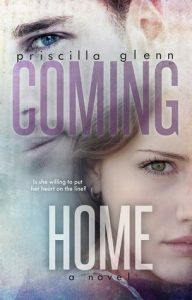 I look forward to reading more from the talented Priscilla Glenn, experiencing more of her beautiful writing and compelling stories. Thanks for your review. I felt exactly the same way but you say it much more eloquently! The thing I like the best about this author (and others like Colleen Hoover and A.L. Jackson) is their ability to take a story and make me FEEL the emotions of the characters. It doesn’t have to have a lot of drama and the emotion is still conveyed in such a way that your heart aches with sadness, happiness, humor, love and the gambit of other emotions that you feel in life. As you mentioned, you find yourself sitting there with tears running down your cheeks without realizing you are even crying! Ah, you picked two of my other favorite authors too, Vicky! And I couldn’t agree with you more! I read this book when it was released the first time and I loved it. I’m glad to see it again and hope it gets the recognition it deserves. I can’t wait to read more from her in the future too!